You’re considering forming an LLC for your business, but now what? It’s important to hire a Florida business litigation attorney to walk you through the steps and determine if an LLC is actually the right structure for your business. Here’s a look at some potential pros and cons to forming an LLC. Limited Liability: As its name suggested, your liability is limited with an LLC. Personal assets like homes, cars, and bank accounts are protected from creditors who are looking to collect. Easy Start Up: Compared to some other business start-up types, the LLC requires less paperwork and has lower filing fees and costs. Flexible Number of Members: LLCs can have as few as one or as many members as you want. Less Structure: Although you have to file articles of organization, the management structure can be more flexible than a corporation. “Flow-through Tax”: This means that the LLC itself is not taxed, unlike a standard corporation where the board members, shareholders, and the corporation may incur tax liabilities. Essentially, it’s a pass-through entity, which means profits go directly to members without being taxed at the company level. Health Care Deduction: The managing member of the LLC is entitled to take up to 100% deduction for health care premiums. 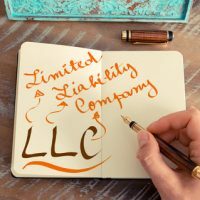 Just as the LLC business model has a variety of benefits, there are a number of potential negatives or downsides to consider. Renewal fees are higher. While the cost of creating an LLC may be cheaper, the renewal fees and publication requirements may be significantly more. You may be taxed as a sole proprietor. If you only have one member of an LLC, the business is still taxed as a sole proprietorship. You cannot pay yourself wages. Sadly, no, you cannot pay yourself a salary with an LLC. There is less structure. Yeah, this is a pro, but it is also a con unfortunately. The lack of strict requirements could mean problems down the line, unless you create a detailed operating agreement, which is where the importance of hiring a competent Florida business lawyer comes into play. Potentially responsible for self-employment tax. The upside of not being taxed on the entity level means profits are taxed on members’ federal income tax returns instead. The IRS considers LLC’s the same as partnerships for tax purposes (unless members opt to be taxed as a corporation.) This means you’re personally responsible for paying Social Security and Medicare taxes based on the LLC’s total net earnings. If you’re researching types of business organizations and are ready to set up an LLC, let McCabe Rabin, P.A. help you. Contact the office today at 561-659-7878 or 877-915-4040 to set up a consultation.